The Society for Industrial Archeology is pleased to publish Occasional Electronic Publication No. 1 by one of our members, David Guise. This valuable guide draws inspiration from a series of occasional publications printed by the Society in the 1980s, perhaps the most popular of which was Occasional Publication No. 4, the Directory of American Bridge-Building Companies, 1840-1900 by Victor Darnell. The purpose of the occasional publications was then and now to offer a format for making available important information for the industrial archeologist that does not fit neatly within the formats of the SIA’s two regular publications, the quarterly SIA Newsletter and the semi-annual scholarly journal IA. The advent of electronic publishing through the Internet has provided an opportunity to revive the practice of occasional publications, since it not only eases the burden of distribution but greatly reduces the costs. Bridges have been a favorite theme of the SIA since its inception. And it is no small wonder since bridges lie at the intersection of advances in engineering knowledge, material science (particularly critical advances in the making and shaping of iron and steel), and transportation development during the nineteenth century. Since industrial archeologists are concerned with the study and preservation of the physical record of industrial development, bridges remain one of the most visible, accessible, and significant products of our nation’s growth into an industrial power. The transition from wood to metal-truss bridges, in particular, lies at the nexus of our understanding of these developments. David Guise has made a significant contribution to advancing our knowledge of America’s historic truss bridges with this research tool. It has long been recognized that bridge patents offer a wealth of information, but using the bridge patents has not been for the faint of heart. The nineteenth-century patents and patent indexes do not use a consistent terminology, can sometimes be cryptic, and are not categorized in a way that would be useful for a researcher trying efficiently to gather information on, say, all patents related to Pratt trusses. David’s research has consisted of reviewing the patent indexes, and one-by-one searching out the patents, digesting them, preparing a brief abstract, and categorizing them into the truss topology that is commonly used by today’s bridge historians. 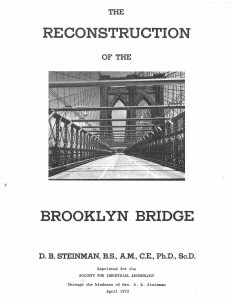 Part I of this publication is a list of the truss bridge patents organized alphabetically by the patentee’s name with a brief abstract of the patent. The abstract focuses primarily on identifying the truss configuration (e.g., Pratt, Warren, bowstring, etc.) and its principal attributes. Part II is a chronology of the patents grouped by truss configuration and organized with the earliest of the patented configurations (arch-braced trusses) listed first. For those unfamiliar with truss topology, there are brief verbal descriptions and illustrative drawings. For those wishing to further explore the patents listed in this guide, the U.S. Patent Office now provides patent text and graphic downloads at http://patft.uspto.gov/netahtml/PTO/srchnum.htm. Even more impressive are the full text searches that can be achieved at the Google Patents website at http://www.google.com/patents. Bridge builders seem to have been an anonymous group. Their products are described as finished objects, artifacts of industry and commerce, symbols in our cities and landscapes. The bridges might have appeared without the agency of man. Most studies are directed to the structures – and general histories, descriptive lists of those in a particular area, and in-depth analyses of individual projects. Perhaps this is a result of the nature of the business, for, when he construction was finished, the crew departed for the next job, the equipment was hauled away, and the only reminder of the builder was his nameplate, which often has been removed or destroyed. Perhaps this is why the completed bridges now seem to have appeared overnight. There has been little study of the men, the companies, and the methods of fabrication and erection. This guide is concerned with the organizations that signed the contracts, coordinated all the parts of the job, took the risks, and produced the spans. It is intended to be of assistance to the surveyors of old bridges, to those who study the history of technology, and to the students of nineteenth-century industry. Trusses – A study by the Historic American Engineering Record (Truss Bridges) – Page 1. Trusses – A study by the Historic American Engineering Record (Truss Bridges) – Page 2.